The US Corp of Engineers has named one of the corporate strategies for environmental destruction, piecemealing. The idea is that those terrible things that some corporations would do to us in their greed, can be made more digestible to us by chopping them into smaller chunks that will be more easily swallowed without choking. We witnessed this during our SWEPCO debacle in which a subsidiary of American Electric Power attempted to run an extra high voltage power line through Eureka Springs, claiming that it was necessary for our own good. They attempted to hide their intent to build a high voltage corridor across the state, at our expense and for their profits and presumed that by dividing their large projects into small chunks they could slip the whole thing down our throats and past regulatory agencies before we noticed. We were very lucky to stop them when we did. Since we have been facing hog problems of our own, I've become very interested in researching the hog farm that was built on a tributary of the Buffalo River National Park and on helping the Buffalo River Partnership Alliance. We see the same strategies in place over and over again, and in the case of the hog farm, the claim is that it's safe (even though it has been proven to not be) and that it has no impact on the Buffalo River National Park. And this is a reminder that when it comes to certain portions of the government and to some American corporations, there is no limit to stupidity, malfeasance and greed. 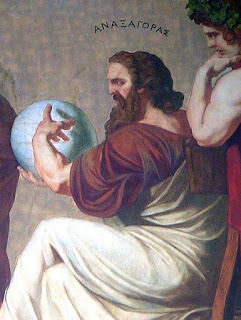 As you can see there is a danger to the powers that be when human beings become acquainted with the inter-connectedness of all things, when they begin to understand their own powers within the universe and find the personal strength and courage to stand up for the principles upon which their own learning rests. Something my father said, but may not have written about as succinctly, was "School is a wholly unnatural environment for children." 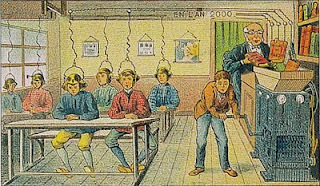 This he meant, in an evolutionary sense, in that the human organism has been around for a couple million years, and it's only in the the last couple hundred, that we've begun confining our young in buildings that house communal learning formats. Sitting all day is in contrast to running, working, helping with hunting and gathering, playing, etc. Piecemealing is also a term that could be applied to how we school kids. 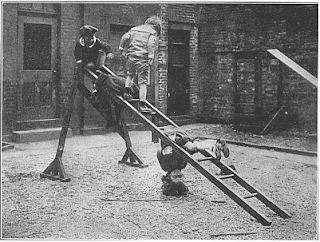 Instead of assisting them as did Froebel to understand the larger aspects of self, and power within communities, schooling can make students feel small, powerless and isolated, most particularly within the larger schools. Piecemealing, on the other hand, is useful when making something. You divide the process into steps, each related to the next and the next. The image above shows the painting of a scissor tail box guitar in a Jackson Pollack style. The next colors to be applied will be yellow, then black. 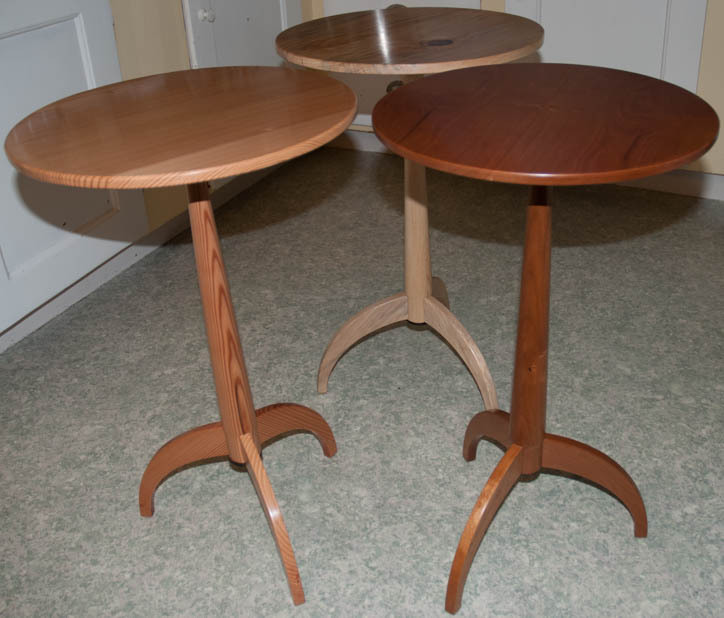 A friend in Stavanger, Norway, Knud Lunde, sent a photo of shaker tables he made for an exhibit of his hobby club, proving it is true that woods and woodworking connect us into the fabric of life in ways that should never be ignored. "One (foreground at left) was a Douglas fir from an 18 m long ship’s mast that drifted a shore on a beach south of Stavanger in 1923. It was collected by a local farmer who cut it in four to use as roof beams in his barn he built in 1924. When his son (a keen woodworker/turner and club member now in his 80’s and still very active) rebuilt the barn in the 1980’s he saved the beams, and gave me a 2m long piece a few years back." To use wood that was once the mast of a ship, that was then a barn, and then saved for use and shared in the making of even finer things (though nothing might be finer than the mast of a ship) shows how the human imagination and the human spirit work. 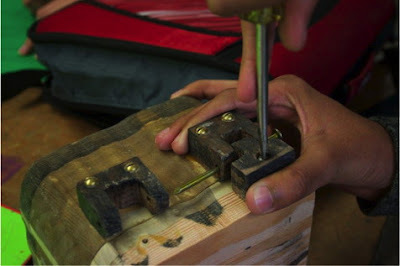 In woodworking, we tell our stories, drawing connections between things and each other, and in doing so, preserve and nourish human culture, and thereby encourage others in making their own contributions to it and to discoveries within themselves. (Was this what Froebel meant by the term Gliedganzes?) It seems fitting that a Shaker table (an American idea) be made from a mast originating in the Pacific Northwest. For that mast to have shown up in Stavanger, told the frightening story of a sailing ship having been dis-masted at sea. Norway has a long history of reuse and recylcing, and much of the old trading city of Bergen was built from parts salvaged from old ships. I have a simple theory as to why students who study science narrowly and in depth, and according to interest perform better on standardized tests than those students who are force fed a broad array of information. While most teachers are trying their best to cover all the information in a text book in its full breadth, students who have journeyed more deeply (and hands-on) into a specific area of study gain a better understanding of scientific process and with it, greater capacity to intuit right and wrong answers. And then there's the passion, too, that arises when a student does real things. Make, fix, create, and extend to others the opportunity to love learning likewise. I have taken a break from cleaning to assemble a "scissor tail" guitar, as you can see in the photos above and below. I've formed a small hatch at the back so that the electronic components can be fitted in. The body of the guitar will be painted with milk paints. The following is from Susan Blow's book on Froebel, Symbolic Education. The prayer of the hero utters the craving of all human hearts. Everywhere man strives and toils to make his children better than himself. Ignorance is ambitious that its children shall be wise, and Sin rarely so sinful as not to pray that its babes may be unstained. And what father and mother crave for their children, each generation as a whole craves for the generations that are to follow it. -- Susan Blow, Symbolic Education. "Given a little power over another, little natures swell to hideous proportions." In other words, if you are looking for heroes in the financial sector or government, forget about it, and Earhart's observation explain why. I seem to have become obsessed with hogs on two fronts. First feral hogs have visited our garden 6 times now and it's like having an army of roto-tillers run amok. On the other front, the Arkansas Department of Environmental Quality gave and has continued to give permission for the operation of a massive hog operation in the headwaters of the Buffalo National River. In the process of approving that stupid, destructive thing, they've chosen to ignore the fact that karst terrain allows the pig poop direct access to groundwater, which then feeds untreated animal wastes directly into the river, thus endangering the 800,000 tourists who float or visit the river each year. In fact, they have claimed that there is no evidence of karst in sight, even though the site is surrounded by limestone bluffs and fractured creek beds. You would have to be a complete ignoramus or a liar to make the claim there is no karst. If there were heroes in Arkansas government, the hog farm would have been halted before built, and if built, then not allowed to continue polluting our nation's first national river. Stupidity is a self-perpetuating cycle that can be passed half-unwittedly from one generation to the next. 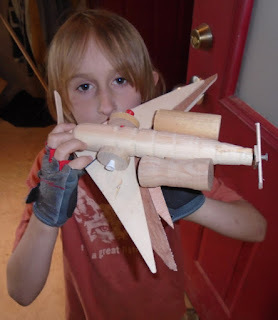 Failure to engage the hands in learning and making, leaves children out of touch, disconnected from reality, and lacking a basic, healthy sense of self. It also leaves them disconnected and estranged from the full breadth of human culture, and from the natural world. Take Donald Trump as an example. On the one hand, he claims that Global warming is a scientific hoax, and on the other hand, that a sea wall must be built to protect his golf course in Scotland that is threatened by rising sea levels. The man is a boor*, a liar and a hypocrite, that many Americans have come to love and support for reasons I'll never understand. In contrast, deep engagement in learning that comes when the hands are involved can lead to heroic behavior. Make, fix, create, and extend an invitation that others may learn likewise. *readers should become acquainted with the definitions of three English words that sound exactly alike, bore, boor and boar. While I have my troubles with boars and pigs in general, the US is having trouble with homonyms. The word boar might also apply to the case in consideration. on the dangers of holistic thinking. One of the things that Friedrich Froebel hoped to instill in children through his kindergarten method, he called by the odd German term Gliedganzes, which meant member-whole. The idea was that a child was both an individual and a member of larger communities consisting of human culture, human economy, and the natural world, including all aspects of nature. So instead of simply teaching children to read and write, he devised a system in which the child would be introduced as an active force within the larger framework of human life. 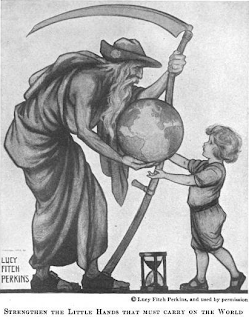 Froebel's first gift consisted of small colored woolen balls, symbolic of larger things, and larger relationships.The illustration by Lucy Fitch Perkins encapsulates the idea that Froebel had in mind. Can it be any wonder that the Kaiser decided to ban Kindergartens from all of Prussia? He wanted a system of education that would indoctrinate students and shape them to fit the will of the state. Holistic thinking can be a danger when corporations choose to exert power. For instance, if we see ourselves as isolated from the things happening around us, we have no sense of our own power (or responsibility) to stand in opposition to corporate stupidity, or the machinations of evil force. In my shop, I've been cleaning. In the school, shop, I've been cleaning in preparation for ESSA classes. Last night I attended the reception/exhibit for Plein Air Painters with the ESPA Fest sponsored by the Eureka Springs School of the Arts and the Plein Air Painters of Eureka Springs. Most of the painters had done a painting a day during their visit to Eureka Springs. I was amazed at their accomplishments and the beauty of their work. The festival and exhibit were an overwhelming success. Last night I also attended a science and music program (Still on the Hill) about the hog farm near the Buffalo River that has been proven to pollute the nation's first national river. I am reminded of the close relationship between the arts, and historic preservation and natural conservation. The arts form a bulwark against senseless waste and destruction. The issues are complex. For example, beauty within a community is often nourished by those who care for much more than money, and is wasted and destroyed by greed. On the Buffalo River, the huge hog farm which raises hogs under inhumane conditions, feeds liquefied hog waste directly into groundwater through confinement lagoons, built over karst terraine. The regulatory agency that gave the permit for the hog farm claims there is no evidence of karst, even though the entire area consists of eroded limestone rock that is plainly visible in every direction. Greed closes eyes to the obvious, and the arts are useful to pry them open. There is always an uneasy relationship between arts and economy. We are often presented with the choice of either making money or doing meaningful things. For instance, most of the Plein Air painters were not in Eureka Springs to make money, but to see and paint beauty. And yet for many or most to pursue their passion, some monetary return must come. On the subject of hogs, we were visited again last night by feral swine that once again roto-tilled through some of our garden beds. If you choose bacon as part of your diet, please choose your pork carefully to make certain it does not come from the hog farm that pollutes the Buffalo National River in Arkansas. Eat free-ranging hogs if you must and remember that hen it comes to greed, the stupidity of governmental agencies knows no limits. 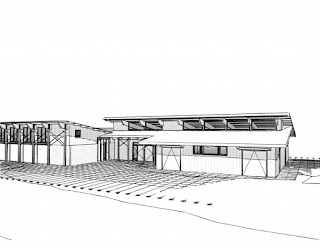 We are in the process of designing the new wood studio for ESSA shown in the image above by architect David McKee. Perhaps if people learn to love wood and woodworking, they will begin to understand and cherish the forests from which wood comes and understand their role in protecting it. Make, fix, create and extend toward others the likelihood of learning likewise. Today is our end of the school year program, "the celebration of the child." Kids and our teachers rehearsed all week. It is a lovely event when each student's special gifts are acknowledged. I spent part of yesterday going through photos, and printing certificates acknowledging student growth in wood shop. This is Plein Air Festival Week at the Eureka Springs School of the Arts, so we have painters who've come from all over the US to document the beauty of our area. They compete for awards and recognition. They spend money in town and help others to see the beauty of our area of the Ozark Mountains. The work I've seen so far is lovely, and the festival is enough of a success that it's likely to become an annual event. It has also been a huge amount of work for the staff, with events both during the day, and in the evening hours. Check out the website linked above, and please watch the video showing how beautiful it is here. The scenes of Eureka Springs are well worth the paint. I must proclaim again and again the role of the arts in sustaining viable community. In 1976, I was the founding president of the Eureka Springs Guild of Artists and Craftspeople. We closed that organization in the 1990's to open the Eureka Springs School of the Arts. We were encouraged by older artists who saw the essential role of the arts in building lives and community. Arts and preservation are essential partners in sustaining the quality of life. Make, fix, create, persevere in the preservation of the past, and build upon it, the love of learning likewise. My summer has almost started, and yesterday I had my last day of class for the school year at Clear Spring School. 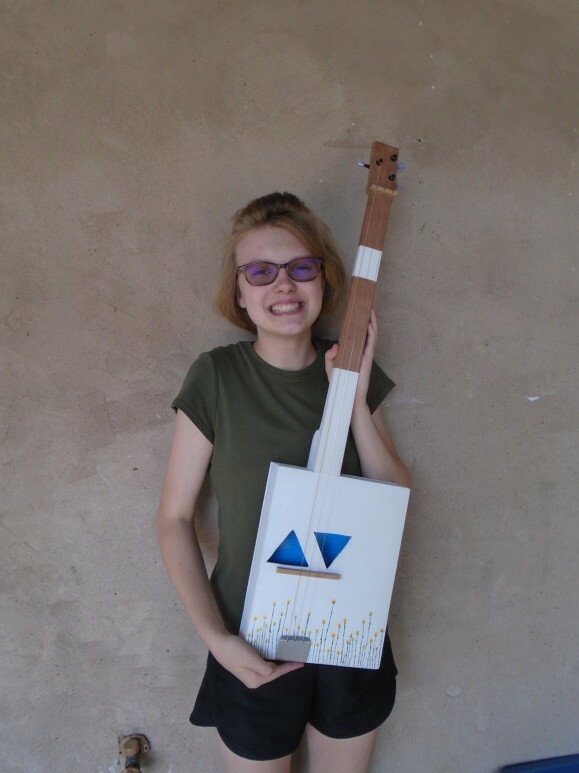 My high school students were busy finishing their box guitars and one finished her battery powered amp. In the photo at left you can see the initial drawing used in the design of Ozric's guitar. While some changes were made, the overall design remained true to his original concept. The design will go in his school portfolio. Today I'll be going through photos of the student's school year, organizing evidence of their learning, and will make a trip to a photo processor so that photos of their work can be included in student portfolios as documentation of their growth. The standard means of assessment in the US is the distribution of letter grades about which many students care nothing. They know that school is about getting through, as though it is something to be endured rather than enjoyed. But students at Clear Spring have other ideas about schooling and while looking forward to summer activities are not pleased to have school out for the summer. I have a busy summer planned that I am looking forward to. On June 7, 8 and 9, I'll have an editor here from Fine Woodworking to take photos for two articles in the magazine that will come out sometime late in 2016 or early in 2017. 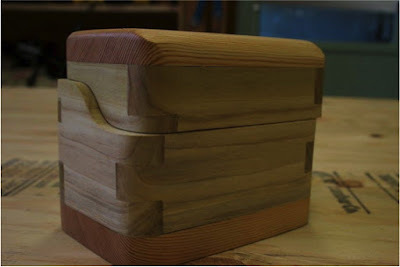 Then on June 15, I'll travel to Marc Adams School of Woodworking for 9 days of class, making boxes and small cabinets. During the summer months I simply change from teaching kids to teaching adults, and never lose access to the opportunity to create beautiful and useful objects from wood. Make, fix, create and encourage others to learn likewise. Tim Holton sent this article about touch: What the Science of Touch Says About Us. And what we can hope is that someday education begins to make use of what science knows about learning. So far, they have not, for education tends to go its merry way, ignoring our most useful and important learning resources. We seem to know the power of visual representations. For example, Comenius, the father of modern pedagogy, introduced the first picture books during his lifetime (1592-1670). But the power of touch has not been so well understood, and has therefore been ignored. The work of Craik and Lockhart (1972) explored how the senses were utilized in the formation of memory. So, in other words, the hands and eyes process learning in a similar manner, although using different parts of the brain, and with the eyes being less efficient at determining scale. One would think that the formation of memory would be of foremost importance in education, right? What is the point of going to such lengths to present massive amounts of information if the children are not to remember a thing? In any case, research shows that memories are made strong and long lasting when all the senses are used if the making of them. For example, when students do something real. Back in the days of educational Sloyd and the widespread distribution of the Kindergarten method, the close and powerful relationship between hand and eye was widely understood. But in time, the hands were shoved aside. They require a higher level of engagement, and for some reason, the hands and the training of the hands did not fit the scheme of massive indoctrination that was to take place in schooling. Make, fix, create, and extend to others an understanding of learning likewise. Over the weekend, I've been going over plans for the new woodshop at ESSA to make certain the various pieces of equipment will fit the floor plan. This is all in advance of the architect's preparation of drawings to put the project out for pricing and bid. It is a fabulous adventure for me, as equipment will be selected and ordered, and the project offers the opportunity for conferences and clubs in addition to classes. In the meantime, I have two more days of class before summer break. Today I will continue organizing the shop for adult summer classes. I say it bears repeating. The central message of this blog is mentioned each day in the hopes it gets through. The message is simple. This blog is like a small electronic device sending a simple message each day into the uncharted universe in the hopes that some distant intelligent life form will respond. But it's not quite as hopeless as all that. If folks simply look at their own lives and their own learning experiences and then look at the appendages dangling at the ends of their wrists, they will realize the truth of what I say. The hands are central to learning. To learn through the eyes and ears alone is to leave learning at arms length, beyond touch and beyond children being touched. We ask children to spend time in isolation from their most effective sensory appendages, and thereby ignore the educator's most important resource: The child's intellectual engagement that arises through the use of the hands. The hands are symbolic of the whole man. When the ship is endangered, the first mate calls, "all hands on deck." He does not say, "Hey you eyeballs, come up and watch the ship go down." And we are at that point in American education. We need to re-engineer learning to take advantage of the educator's best gift for the engagement of student minds: the hands. Why does this work? The answer may be in: the level of processing effect. The levels-of-processing effect, identified by Fergus I. M. Craik and Robert S. Lockhart in 1972, describes memory recall of stimuli as a function of the depth of mental processing. Deeper levels of analysis produce more elaborate, longer lasting, and stronger memory traces than shallow levels of analysis. Depth of processing falls on a shallow to deep continuum. Shallow processing (e.g., processing based on phonemic and orthographic components) leads to a fragile memory trace that is susceptible to rapid decay. Conversely, deep processing (e.g., semantic processing) results in a more durable memory trace. This theory contradicts the multi-store Atkinson-Shiffrin memory model which represents memory strength as being continuously variable (1968)/ Where assumption that rehearsal always improves long-term memory. They argued that rehearsal that consists simply of repeating previous analyses (maintenance rehearsal) doesn't enhance long-term memory. Anaxagoras, Greek philosopher shown above, said that man is the wisest of all animals because he has hands. So how do we become wise if we ignore them and continue with schooling in which their use is so seriously curtailed. I have been getting some feedback from my Portland classes. 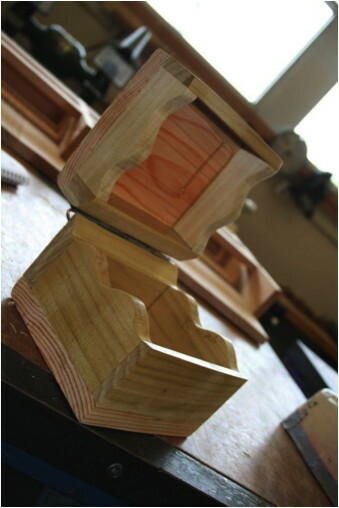 John Kinnear sent this lovely photo of a box for Froebel's gift number 5 that he made for his grandson's birthday. You know it will be treasured for a lifetime, as the box itself is exquisite and the blocks nested inside will receive hours of creative play. John was a student in my two day box making class and had been a teacher for over 30 years. He knows that the intellectual charge given by parents, grandparents and other caring adults is the most powerful force in a child's development. Yesterday I delivered a hand-carved jewelry box I had made years ago to a woman in Berryville, Arkansas. I made the box for an article in Woodwork Magazine and it has been in my office for years. But the woman remembered it and asked if it was still for sale. When I delivered it, she said, "your work makes me happy." Jacob Cogger at Waldo Middle School in Salem, Oregon invited his 12-14 years old students to make boxes following the educational symposium we held in Portland during my week there. He says they used my boxes for inspiration. 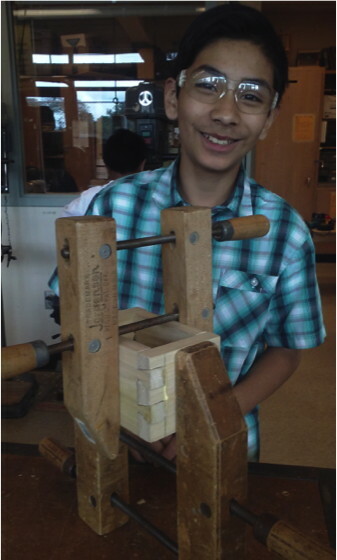 If you have any doubts that woodworking is a useful class to have in every school, perhaps the following photos will put those doubts to rest. These boxes were bravely done. 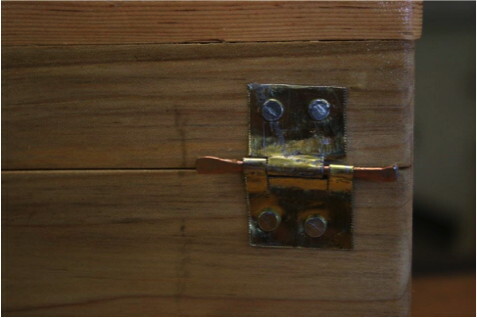 Can you imagine making your own hinges, either from metal or wood? Most woodworkers choose to buy hinges instead. 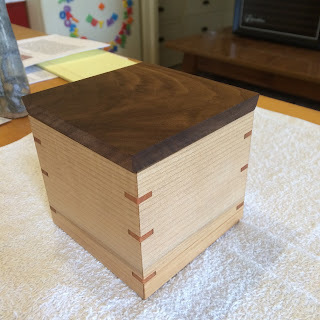 Some are made with box joints, and others with hand cut dovetails. 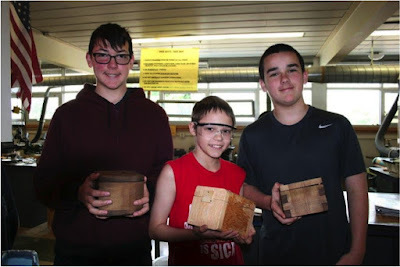 Each of these boxes is unique, and involves the testing of materials, learning the properties of wood, and applying skill, imagination and attention to an object that will serve lifelong as evidence of learning. Each is an expression of useful beauty. I want to thank Jacob and his students for sharing their marvelous work with me. I can honestly say to each of them, "Your work makes me happy." Last night was the White St. Art Walk in Eureka Springs, and I showed my work to interested persons and sold some of it. The event is normally a time to connect with old friends much more that than an opportunity to sell work. The weather was perfect and the street outside Lux Weaving Studio turned into a full fledged street fair. The artists who started the annual event have become a sideline attraction, but is that not how things work? I am reminded of an American cello player who toured China as an amateur musician. He told that as he played in a Chinese home, the children would get on the floor and wrestle and play, but when he'd stop, the children would stop playing and stare, wondering why the music had stopped. Is that not the place of the arts in the scheme of things? We provide the backbone of human culture around which all else follows. The American musician had presupposed that people might listen as one might listen to a church sermon, but the children responded in a more honest way, by letting the music invigorate their lives. On the title of this post, the National Science Foundation, wondered what people knew about science and technology, and discovered, not much. Most Americans are probably not technologically literate. They have little conception of how science, technology, and engineering are related to one another, and they do not clearly understand what engineers do and how engineers and scientists work together to create technology. Those are the major findings of a recent report issued by the National Academy of Engineering (NAE) and the National Research Council (NRC) (Committee on Technological Literacy 2002). In addition, the International Technology Education Association (ITEA) concluded from its 2001 survey that "adults are very interested in but relatively poorly informed about technology" (Rose and Dugger 2002). Technological literacy is particularly important for decision makers in business, government, and the media. However, as the report notes, "there is no evidence to suggest that legislators or their staff are any more technologically literate than the general public." Technological literacy is extremely important to the health of the U.S. economy. Technological innovation is a major factor in the vitality of the economy, and an increasing number of jobs require workers to be technologically literate. It appears that as we've become a nation of smart stuff, stupid people, and we need to do a better job educating students, and educating teachers to teach students, and give more trust and training to teachers to prepare students for learning, and we ought to have a sense of urgency about it. We also need to give teachers a clear mission to teach hands-on so that each child will be drawn into deeper engagement with technology and the arts. We must consider how to infuse schools with the more fundamental technologies that provide an entry point to understanding tools and materials so that students begin to grasp the ways in which our technology driven world can be taken into their own creative hands. Wood shop, music, the arts, and laboratory science each have a part to play. One of the highlights of my night was to see many of my students from Clear Spring School. My second grade student's fanciful triple wing prop/jet will be treasured for weeks. It is more or less a collection of everything he knows about airplanes. 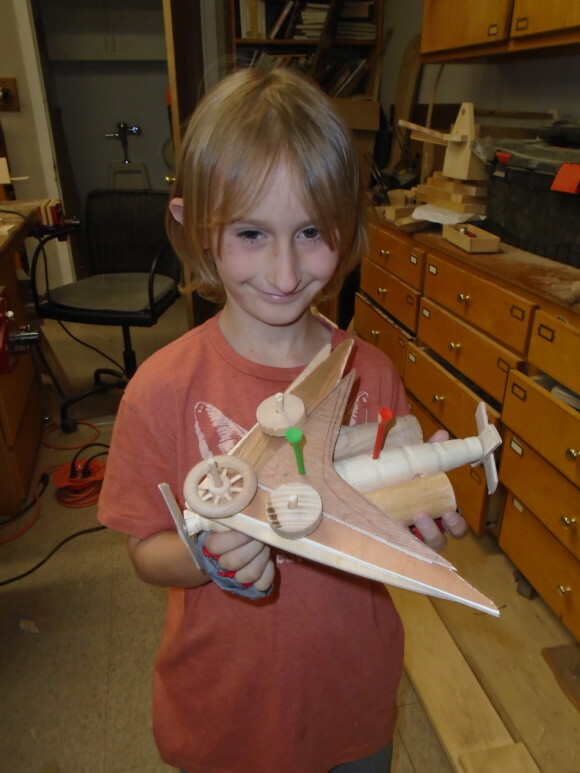 It has wheels, wings, jet engines, propellers at front and rear, and the top wing rotates to give some control during flight. (Have real aeronautical engineers thought of that?) The extra wheels give the pilot something to do. The green golf tee is used to lock the wing in position. I realize at this point, that a revolution in the way we teach kids is not coming soon. Enabling personal creativity is not the goal of public education. If it produces a steady stream of consumers, mired ball and chain to the measurable economy, the financiers and politicians they control are happy indeed. But when you take matters into your own hands, by making your own toys, or making your own music, or by making beauty and meaning in your own life, you are withdrawing at least in small measure from the control of those who care so little for what they've messed up. The school gerbil died yesterday morning and 4th 5th and sixth grade students came into the wood shop to build a coffin and to make a memorial marker. The graveside service was a sweet thing. Lil Scratch and his partner Chewy lived good lives, and brought a great deal of joy to our students over the last 3 years. I have two more days of class at the Clear Spring School and then will begin an intense cleaning of the wood shop to prepare for ESSA classes. I have nearly finished a second ukulele, and will spend the day getting ready for the White St. Art Walk which will take place between 4-10 PM here in Eureka Springs. As usual, during the White St. Art Walk, I will be displaying and selling my work at Lux Weaving Studio. Come and see. I will be signing copies of my new book. Unsigned copies are available at a discount from the link below. Use the code STOWE15 to receive a 15% discount. 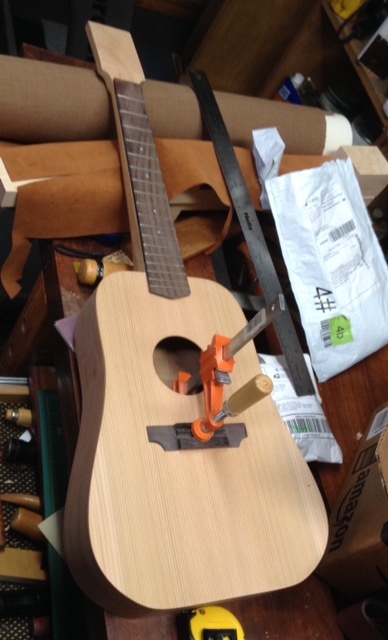 My second ukulele is nearly complete as you can see in the photo. When I have a coat of finish on it, I'll put my instrument making aside to do other things. 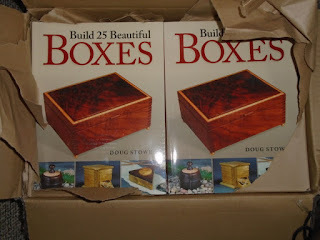 My new book, Build 25 Beautiful Boxes is being offered at a 15% discount from ShopWoodworking.com. Follow the link below and use the discount code stowe15 during checkout to receive your discount. Shipping is free for purchases over $25.00. This new book is a compilation of my first two books that the publisher allowed to go out of print. If you don't have Creating Beautiful Boxes with Inlay Techniques, or Simply Beautiful Boxes you may find this book useful. It is available both digitally and in hard copy through the link below. In the meantime, I am going to be busy today setting up for the White St. Art Walk,beginning to clean my wood shop in preparation for a visiting editor from Fine Woodworking, and starting to plan for my summer classes. 12 words that explain so much. As you can see I have another ukulele in the works. This one has a longer neck and larger body for a deeper tone. Like the first, it has a cherry neck, back and sides with a western cedar top. 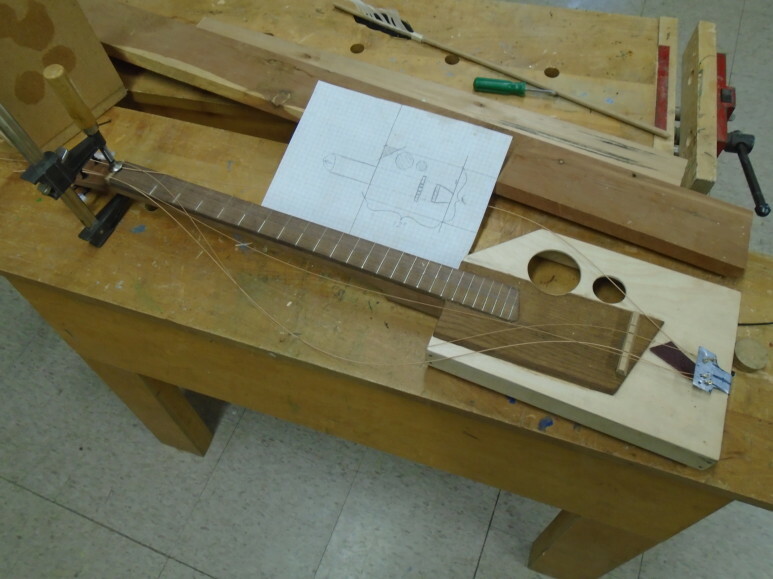 I've also begun attaching necks to box guitars, and have a boat load of work to do at school to be ready for the end of the school year, and the launch of ESSA classes. In addition, I have an editor coming from Fine Woodworking for a 3 day photo shoot in June. I'll spend some time next week cleaning my own shop to get ready and may have to suspend guitar and ukulele making for other things. The quote from Amelia Earhart is useful to explain the current political situation in the US. We have an enormous number of folks who are out of touch. Crafts, on the other hand, can be a humbling experience. If you get carried away with yourself, mistakes in your work bring you back to reality. While politicians can surround themselves with those who slavishly agree with every foolish whim, those who work in closer relationship to reality are granted no such license for delusion. Time magazine columnist Rana Foroohar has a new book about capitalism called Makers and Takers, the rise of finance and the fall of American business. I hope it sheds some light on an important subject. Our society places great power in the hands of those who would gladly take it from us. Does Donald Trump come to mind? 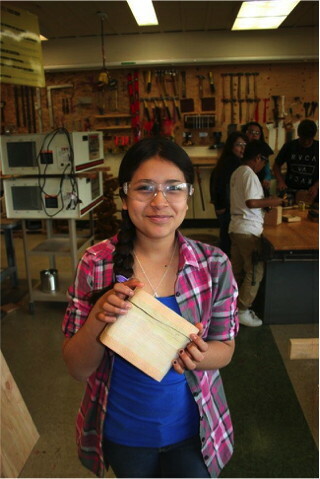 Today in the CSS wood shop, my students will be finishing their projects to be ready for the end of the school year. My first ukulele is nearing completion with the finish applied in several coats, sanded between. It has been a fun project, and I have 5 more in the works. Parts that would seem difficult are not so if you have some basic experience in working wood, and on this uke, some of the hard part is taken away by the purchase of a Chinese made fret board, nut and bridge costing only about $10.00. For the book, I'll demonstrate making your own fret board on another project, so that those who have the inclination can make their own. Part of the challenge with any craft is having a well defined set of standards at various stages, with regard to the fit of various parts. For instance, if the sides are not bent and assembled square to each other, and if the linings are not glued in place flush with the sides, you've created huge problems that could lead you to start over or give up, so careful standards must be met at EVERY step, unless you are looking for something rustic that will likely never be in fine tune. I often think of crafts as being almost interchangeable and craft skills as being transferable between various materials and products because standards of workmanship are required in each, and once having set personal standards of craftsmanship those same standards (and expectation of self) can be applied in a wide creative arena. These standards set to a high level in one endeavor may not be immediately met when a craftsman launches his work in a new direction, but having developed a high standard in one thing, the pathway toward a higher standard of work will be at least familiar to the craftsman should he or she choose to proceed toward finer work. So here we come to the problem in modern schooling. While the craftsman sets his or her own standards having to do with sense of self, he or she chooses work in a field that requires depth according to personal inclination. Schooling demands that students move along the surface of knowledge performing to externalized standards that may only rarely be internalized unless the selected craft is one that takes place within the classroom environment. Writing and doodling are examples. This is not to say that listening is not an important skill. But if listening was a skill actually taught in school, you would think that people would be better at it. I am getting ready for the White St. Art Walk, and concluding the year at the Clear Spring School. Children are challenged to maintain a particular grade point average in order to get into the colleges of their choice. The grade point average is an abstract measure of how they did in a smorgasbord of various subjects, and from high school through college students are challenged to maintain a high average. In fact, they can"flunk out" if they don't have one high enough GPA to meet standards. David Brooks wrote an editorial in the New York Times, Putting Grit in its Place, challenging our reliance on grade point average as a measure of student success. Suppose you were designing a school to help students find their own clear end... Say you were designing a school to elevate and intensify longings. Wouldn’t you want to provide examples of people who have intense longings? Wouldn’t you want to encourage students to be obsessive about worthy things? Wouldn’t you discuss which loves are higher than others and practices that habituate them toward those desires? Wouldn’t you be all about providing students with new subjects to love? In such a school you might even de-emphasize the G.P.A. mentality, which puts a tether on passionate interests and substitutes other people’s longings for the student’s own. Today in the CSS wood shop, some of my students will be turning bowls on the lathe. Some will be finishing their box guitars.I am ready to begin applying finish to my first ukulele. One of the best ways to bring passion within the school walls is to bring in the arts. Teachers should be held accountable in their own lives for having passion for learning and for kids, and should be enlisted to bring those qualities within the school walls. Those with passion do not remain on the surface of things, but instead go deep. Artists are the ones who dive deep into things, whether its in music, culinary arts, graphic arts, or our many crafts. And of course one of the best ways to get messy is through the arts. In the large scale research done by Ted Bredderman in the 1980's: The Effects of Activity-Based Elementary Science Programs on Student Outcomes and Classroom Practices: A Meta Analysis of Controlled Studies one the the many points for comparison and analysis concerned the amount of time spent talking in class, either by the teacher or by students. The assumption was perhaps that time spent talking (a thing that could be easily observed and measured by researchers) was probably time spent not doing, and if the initiative in science education was to change learning so that it was active instead of passive, the amount of time spent verbally engaged indicated that either the old ways were still in play, or the hands-on approach that the National Science Foundation was hoping to encourage was beginning to take root. Bredderman and others distinguished between knowledge of facts and theory and understanding of the scientific process, and the NSF at the time was concerned that students did not understand scientific process and methodology. No doubt, the NSF has the same concerns today. The interesting thing is that if you better understand the process of science, you can better intuit the right answer on standardized tests. If you are oblivious to science process, you are unlikely to come up with correct answers in standardized tests unless you have covered the exact material in class. Students in science continue to be fed a diet of facts and theories that leave them disengaged and uninspired, whereas engagement in science process builds the possibility of further engagement. It is funny how so many years can pass with some things remaining exactly the same. Next week we will have a visitor on the Clear Spring School campus who will show kids how to blow things up. OK? In the photo above, you can see my steady progress making my first ukulele. The finger board and bridge have been shaped and sanded, and the finger board has been glued in place. The bridge will be glued down after the body and neck have been finished. Today I get no shop time. I will help others to set up tents for the Books in Bloom literary festival, and then pick up author Laura Lippman at the airport to bring her just in time for her presentation at 3 PM. At 5 I assist others in taking down tents. At 6 PM, I've invited Brian Biggs, author/illustrator to see my box guitars. He plays cigar box guitars and ukuleles so we have a thing or two in common. As you an see, I am almost ready to attach the neck to my first ukulele. When it is screwed in place, I can glue the back on and begin sanding. This is Books in Bloom weekend when the literary festival my wife and the Carroll and Madison Library Foundation started 11 years ago brings readers and writers together in a lovely outdoor event. I will be occupied by tasks and chores and unlikely to get much shop time today or tomorrow. In the meantime, we can ask the simple question, "if we know that hands-on learning works best, and has been proven to work to greatest lasting effect, why don't we do something about it?" Simple question, perhaps, but the answer is complex. I'll simplify things in four parts. One part of the answer of course, is ignorance. We've had generations of teachers who have never been encouraged to test a hands-on approach. Getting them to see the light requires that they be challenged to grow in ways they never dreamed before. They have been rewarded with the idea that they are smart due to their facility with a particular style of learning that only fits a small proportion of the population, and are likely untrained in any alternate learning style. A second part has to do with the perceived value of information, vs. understanding of process. Having information allows you to test well. Understanding process requires that you actually do real things and gives the capacity to continue doing real things. And the third part is that hands-on learning can be messy and chaotic. It involves tools, and students in varying degrees of action, rather than being desk bound and complaisant. In other words, it's messy, when policy makers and administrators want things clean, quiet, and orderly. Real learning is not. A fourth part is that because hands-on learning is messy and requires tools and materials, even as simple as paper and scissors, more individualized teaching time is required. Any one of these four parts could be sufficient excuse for those who want education on the cheap and are willing to sacrifice future generations and future prosperity on the altar of the almighty dollar. Yesterday I attended the reception for Eleanor Lux as the third Arkansas Living Treasure from my small city in Arkansas. Larry Williams was named the Arkansas Living Treasure in 2006. I was awarded the distinction in 2009 and Eleanor, 2016 makes 3. And we were all together for the event. There are 15 total in the whole state, so you can see that a community so totally dedicated to the arts has become an oasis of quality work, in which artists encourage each other and help each other to grow in their work. In the shop, I worked on necks for ukuleles and book matched tops and backs. The tops are resawn from western cedar, known for its tonal qualities, and the backs are book matched cherry. The cherry may not look like much in the photo, but will darken and become more beautiful when finish is applied. The manufactured fretboard laid on the glued up stock shows the first step in marking and making a neck for a ukulele. Today I will shape ukulele necks and begin adding necks to box guitars. 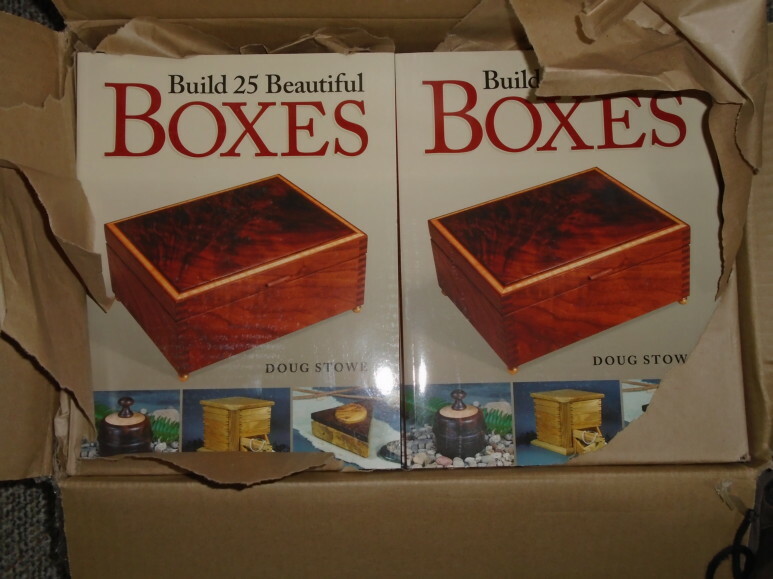 My new book, Building 25 Beautiful Boxes is now available at the Woodworker's Book Shop as either eBook Build 25 Beautiful Boxes eBook at Shop Woodworking or real copy Build 25 Beautiful Boxes at Shop Woodworking Use the code WW10AFL to receive a 10% discount on your order. Shipping is free for orders totaling $25.00 or more. Today in Eureka Springs, the Arkansas Arts Council, the Department of Arkansas Heritage and local citizens will gather to honor Eleanor Lux, who has been named an Arkansas Living Treasure. Arkansas is one of very few states that name Living Treasures in the field of crafts. Eleanor is the third craftsman in our community to be awarded this honor. With about 15 living treasures scattered across the state, three are in Eureka Springs. So I guess you can understand that this is a special place to live and work, and that we have ways of encouraging each other. Yesterday in the wood shop at Clear Spring School, I started some of my middle school students turning bowls on the lathe. May the guiding star and rudder of our didactic" be this: to search out and discover a rule in accordance with which teachers teach less and learners learn more... Comenius. In the early 1980's the National Science Foundation did an exhaustive study of the effects of hands-on learning, as it realized that hands-on science was far superior to lecture based learning that left students disengaged and uninspired. That study can be found here: The Effects of Activity-Based Elementary Science Programs on Student Outcomes and Classroom Practices: A Meta Analysis of Controlled Studies. For the effects on student outcomes, a meta-analysis of 57 studies resulted in 400 separate comparisons involving 13,000 students from 1,000 classrooms. An average improvement of 20 percentile units on science process tests for students in activity-based prgrams over those in other programs was found. This improvement was significantly greater for disadvantaged students and less for advantaged students. As will all such studies of hands-on learning, the educational policy makers ignored this study. Today I will be attaching necks to box guitars and making necks for Ukuleles. History of Kindergarten Trailer from Match Frame Creative on Vimeo. Today the Clear Spring School elementary school students are camping. My upper students will be working on independent projects and finishing their guitars. In my won shop, I plan to begin making necks for Ukuleles. The video above is a trailer for Scott Bultman's Kindergarten history film project which is currently underway. I may play a small part in it related to the effects of Kindergarten on the development of the manual arts. My own Kindergarten project, Toys that Teach, is in the editorial stage with my editor digging through the many files and photos I've prepared, trying to arrange all the material into a publishable form. 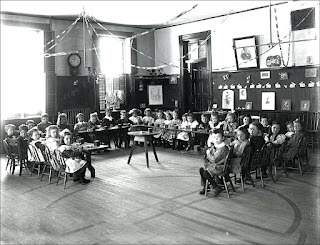 One of the big problems in the introduction of Kindergarten came when they attempted to superimpose the kindergarten method onto classes of the size routinely formed by school boards in other subject areas. It was assumed that because you could stick 30 students into a lecture class, you could do the same with Kindergarten age students. But anyone with practical experience doing real things in the real world would understand the necessity of working in much smaller groups. 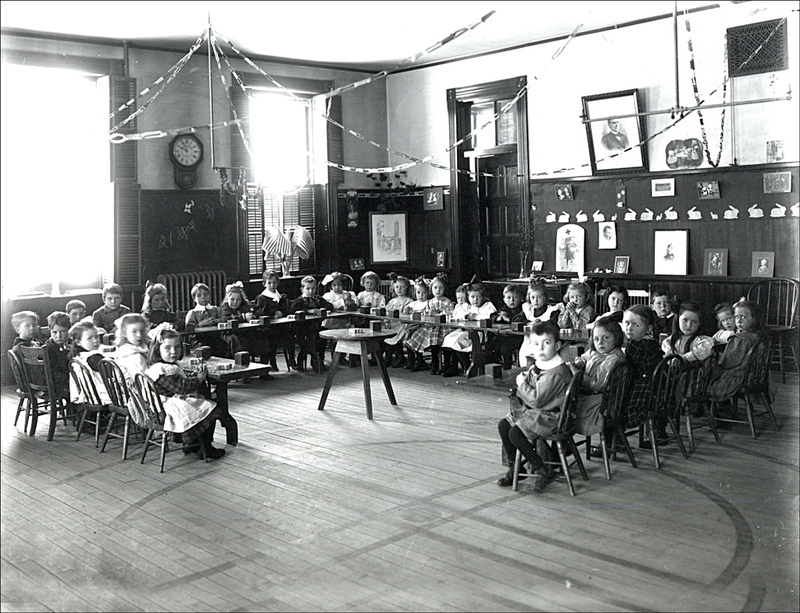 In the photo showing Kindergarten children in Keene, New Hampshire, all thirty children have their Froebel blocks and boxes for them laid out on their desks, making a display of their use of Froebel's materials, but with teachers and school board having missed a very important point. 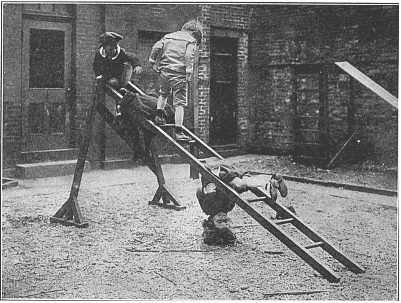 What might work very well with 5 students or even ten, becomes unmanageable with 20, 25, or 30 in increasing degree, and the pleasure on both sides (for teachers and students) in the use of Froebel's gifts, is quickly lost when the sense of discovery is overwhelmed by ritualized management of their use. Scott Bultman shed some additional light on the photo above. The table at the center of the group of Kindergarten students was where the teacher, shortly before, had demonstrated the form that the children were to build. The circle and lines painted on the floor were for the morning circle, a ritual performed each day by gathering the children on the floor around it. In order to serve children well, we must hire and train many more teachers than schools are willing. I now have a "new" book out, which is actually a compilation of my first two box-making books that the publisher had let go out of print. My complimentary copies arrived by UPS today, so they will be ready to ship from Amazon within the week. I signed a new contract, received a small advance and I went through all my old slides to bring these projects back to life. Included at the tail end of the book are the philosophical sidebars that led me to consider writing the books in the first place. Today the upper and lower elementary students and teachers at the Clear Spring School are leaving for the spring camping trip. I'm supplying them with whittling sticks, knives and sharpeners. Yesterday we finished the garden gates. 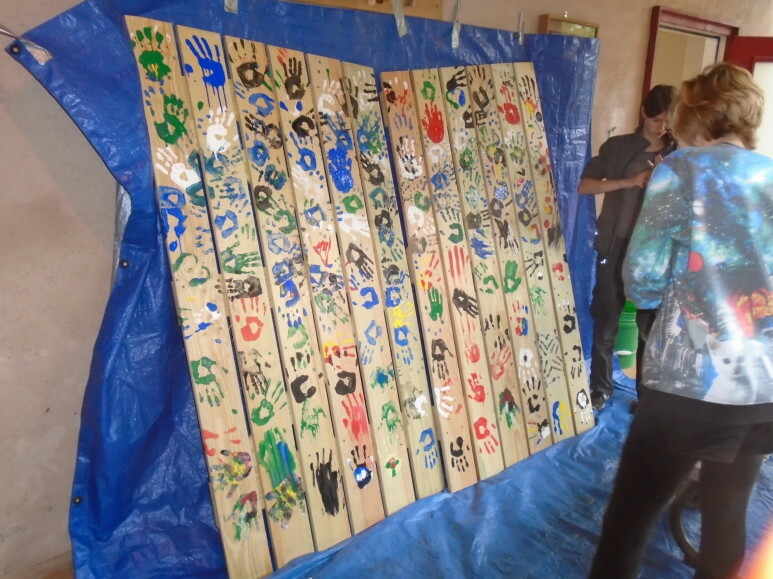 Students planed the edges of the boards to eliminate splinters, and then all the students applied paints, hands-on. Following the end of World War II, people were left wondering how a single politician could gather so many mindlessly subservient followers and lead them to do such horrible things. Psychologists came up with a personality profile they called the Authoritarian Personality Type. Theodor Adorno and others devised a simple test that you can take online to determine whether you are ready for mindless obedience such as that demanded by Hitler before and during WWII. A belief in simple answers and polemics - i.e. The media controls us all or The source of all our problems is the loss of morals these days. Along the same lines, I was telling friends about the work of Herman T. Epstein, whom I've mentioned before in the blog. Epstein and others had determined that only about 30% of people were capable of rational thought, thereby presenting a great danger to American democracy. There appears to be a relationship between the way we school our children and the potential for developing the Authoritarian Personality Type. While Herman T. Epstein is no longer with us, his explanation of the consequences, The fourth R, why johnny can't reason should be on every educator's summer reading list. Krause, who was well read in the works of Comenius, drew Froebel's attention to the noble old bishop's treatise on the earliest education of children, Schola Materni Gremii; and thus probably aided in turning Froebel's mind to the field in which he was to win his greatest triumphs. Philosopher Krause was pantheistic, having witnessed the wonders and presence of God in all things. Froebel, too, was accused of being pantheistic and though he rejected the label, seemed to have found God in all things, most particularly in the nature and in the activities of children. Pantheism was regarded as an assault to the authority of the church and to the authority of the bible in Germany of Froebel's time. In the wood shop I've been sanding necks for box guitars, and as you can see, I've made many of them. I started with 80 grit and will work my way, grit by grit to 320. Sanding is one of those wood shop tasks that some try to avoid or mechanize so it can be done as quickly as possible. But moving through the right sequence of grits will make the task more pleasurable and easier, too. My next steps when the sanding is complete, will be to square the ends of the necks so they can be attached to the bodies of the guitars. 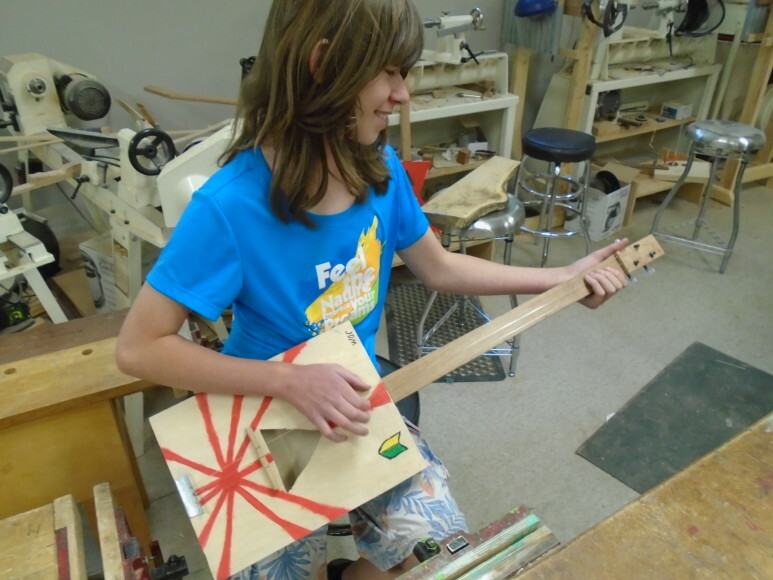 Today in the Clear Spring School wood shop, students will be finishing their box guitars and birdhouses. This is mother's day in the US and for many, the tradition is to buy cards or flowers and take Mom out to mother's day brunch. In some nations, the original idea was "Mothering Day" which celebrated the ideal of mothering as much as the mothers themselves. Comenius was the first to formally recognize the mother's role as the child's first teacher. ... all children, rich and poor, high and low, boys and girls, were to be educated. Instruction must begin in early youth and follow the course of nature. For this purpose, he outlined an ideal scheme which extended from the birth of the child to the age of twenty-four years. The Mother School would last the first 6 years of a child's life. The primary school would would then follow from ages 6-12. University would carry forth from there with research and specialized study in various fields of science and the arts. lay the foundation for all that he is to learn in the later life. He is to be given simple lessons in objects, taught to know stones, plants, and animals; the names and uses of the members of his body; to distinguish light and darkness and colors; the geography of the cradle, the room, the farm, the street, and the field; trained in moderation, purity, and obedience, and taught to say the Lord's prayer. In the first school the mother is to be the teacher. Instead, mothers, particularly poor mothers, are required to farm their kids out as early as possible so they can become economically employed. In the US, child development is rarely studied in school, and child care workers are often poorly equipped to serve in place of real mothers. So instead of taking mothers to brunch as a token of our esteem, we should empower them with the time and knowledge to fulfill Comenius' ideal. A whole system of mothering schools across this great land would be ideal. In mothering schools, mothers (and fathers) would encourage each other in the care of their kids and become educated in the principles of progressive child development so that we might better care for each other and develop a citizenry better capable of caring for this planet. In my wood shop, I've installed lining in the bodies of my Ukulele's and have been sanding the tops and bottoms flat for the backs and tops to be glued in place. You can see an array of slightly variable shapes and sizes in the photo above. My bending technique does not give the perfect Ukulele shape (whatever that is), but has enabled me to create guitar like forms. One must wonder how the first guitars were made. Were the sides soaked and bent to whatever form the wood would take and hold? Most luthiers use a bending iron that heats the wood at various point allowing them to gradually tweak the shape to final form. As you can see, I'm in the process of adding what most luthiers call "lining. "The thin strips are kerfed through many closely spaced cuts on the band saw. They are flexible and can be glued to the sides so that they in turn, present sufficient surface area for the top and back to be glued on. Common wooden clothes pins work well as clamps to hold lining in place as the glue dries. Once the lining is glued in place, the whole front and back can be sanded flush using a flat board covered in self-adhesive sandpaper. With the sides of the ukuleles formed and lined, I'll turn my attention to attaching necks to the other box guitars I'm making, and will also take some time to organize some of the photos I've taken so far. Then the actual writing will begin. The interesting thing about writing is that it is easier if you've given yourself something real to write about. This has been teacher appreciation week at the Clear Spring School and so there have been special treats provided during the week, and the week culminates with a luncheon this afternoon. In my own woodshop, I've been using a rasp to continue shaping guitar necks, and also making kerfed lining material for the insides of ukuleles. I tried making the kerfed lining on the table saw but kept having it come apart due to the impact of the saw. I finally settle on using the band saw. It may seem tedious but takes no more than about 10 to 15 minutes to make enough for a uke. Some of my box guitars have thick enough sides so that the kerfed lining is not needed. But for bentwood sides, the kerfed material is used to thicken where the top and bottom are glued so better adhesion results. The photo below shows new clamps I've made for gluing the top and bottom on box guitars. These use common carriage bolts, washers and wingnuts or knobs and cost just over $1.00 each in the US, provided you make your own wooden parts. With kerfed lining made, I can begin gluing it in place. Photos may come later in the day. I am nearing the end of the school year, and the month of May is always packed with extra activities. My students are finishing their box guitars. Some are on the funky side. Some are very nice. The kids are proud of their work. Some may not get finished. But I can only do so much. Today I will work on guitars and ukuleles in my own shop and attend class with my lower elementary school students in the afternoon. 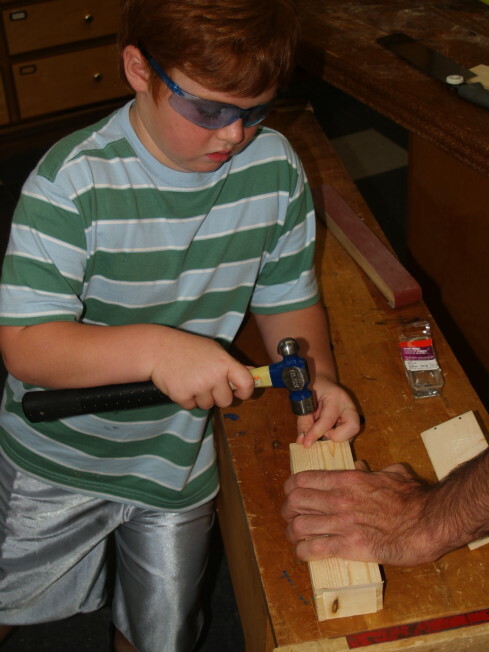 Official word is out that The Eureka Springs School of the Arts received a large grant to build a wood shop on the ESSA campus. It will consist of a machine room, a bench room and a lathe room, and I'll be involved in the planning over the next year in addition to my usual work. 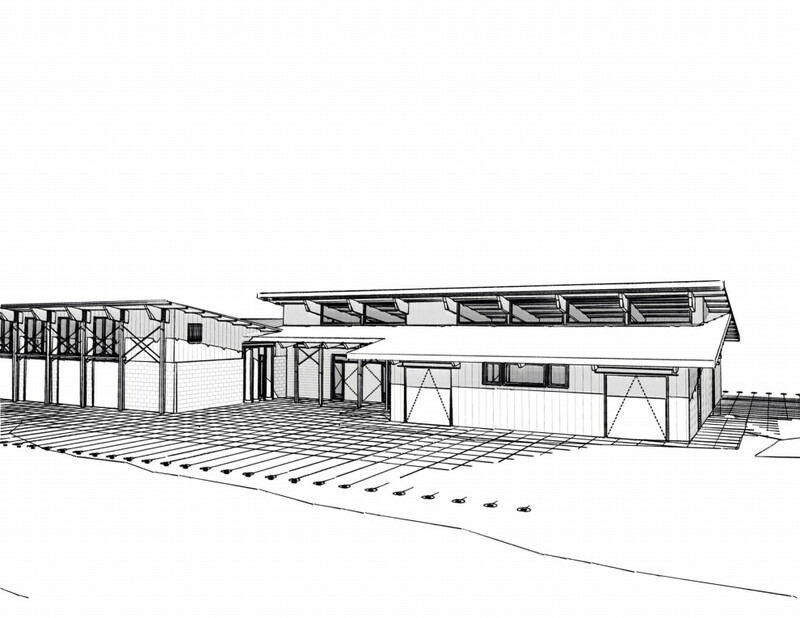 The new facility will allow for at least two concurrent classes and allow for year round classes in wood carving, box making, furniture design and wood turning. The grant has a matching component in which community members will be asked to raise nearly $100,000 to buy tools and equipment. Woodworking has been a popular field of study at ESSA and in the past and during this summer, my Clear Spring School wood shop has been used for adult classes. The new adult sized facility will bring new opportunities for both schools, for the community and for the region. May is also fine arts month in Eureka Springs, and while I'm uncertain what "fine" arts are, I'll be a participant in the White St. Art Walk on May 20 and on the weekend before, May 15, will be involved in helping my wife with Books in Bloom, the literary festival that she co-founded about 10-12 years ago. As to sound learning, it admits of a threefold division; for we learn to know some things, to do some things, and to say some things; or rather, we learn to know, to do, and to say all things, except such as are bad. There we have it in a nutshell, except that I would not divide such activities in equal measure, for with doing comes knowing at a deeper level, in in doing you are given things worthy of talking about. Make, fix, create,and extend to others the love of learning likewise. In the photo at left, you can see that my ukuleles are beginning to come together, with the sides being joined into a completed shape. I have no training as a luthier, and know that real luthiers would likely look askance at my methods. So what. I'm making these things, will write about them and lead my readers into engagement with their own creativity. I don't think they'll mind. Today one of our students was waiting for a ride and watched a parade of ants. How can one but wonder in the face of such things? Does each individual ant have some degree of self-awareness? A sense of duty? Is consciousness reserved so that only humans have it? Read again, the paragraph in quotes immediately above this one. There might be some danger to the machinery of the modern industrial state if we were to consider that even an ant might be a sentient being. We might rebel in some way, discover our own higher consciousness and make something more of our lives and give something more to the lives around us. Yesterday in the wood shop at the Clear Spring School, I began making gates for the school garden, and my lower elementary school students whittled and one made a wooden light saber. Today in the wood shop, my middle school and high school students will work on finishing their box guitars, my upper elementary school students will finish their bird houses. I'll have guests visiting this morning to learn more about my program. Today at school we had a "round robin" with students moving between work stations to practice for their camping trip next week. At one station, they discussed and agreed upon the rules. At another station, the students practiced building fires and discussed fire safety. At my station, we discussed knife safety, we talked about sharpening, practiced sharpening, and whittled green branches of cherry wood. Even though my students frequently whittle in wood shop, the introduction of green wood gave the work a particular interest. Students learned why green wood is called green, and enjoyed themselves at the same time. I also tried to suggest to them that knives were not just tools for working wood, or for cutting meat, but are instruments for scientific investigation. Having dissected a salamander last week, one suggested, "You mean like a scalpel?" But yes, and even more. You really cannot successfully whittle a stick without beginning to formulate rudimentary scientific hypotheses and building the kind of attention necessary for scientific observation, and artistic investigation. With a knife you can cut deep into material reality and create new form at the same time. The knife is an educational tool that empowers minds to observe, to know, and to create. The knife makes large demands on thought and on the hand. The saw can be operated mechanically while the knife requires a freedom, which consists in developing one's own effort. In hand skills in particular the knife holds a position similar to that which the freer forms for the moment hold; its use is also especially suited for the development of the sense of form in right angle and curved forms. What counts with the knife is to be able to freely put it to use through a multitude of hand movements, under which the aimed at form must be brought into clear focus, and the nature of the wood and action of the tools steadily observed. This compels to continual consideration and continual search for the desired form lying in the material before its emergence. All Sloyd work needs to be guided onto this track. 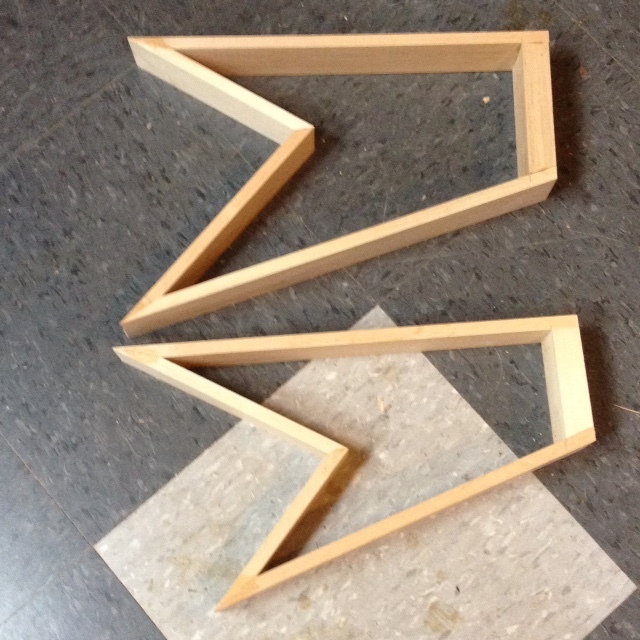 In my woodshop, I've been continuing to make box guitar bodies, and will soon have so many I'll need to quit. In the photos you can see that my Ukulele boxes are dried and holding their shape while two more sides have gone in the forms, and a third form has been crafted. Below, you'll find my scissor tail guitar design. Do you think this book will be fun and an inspiration to budding guitar makers? I hope so.